Can you tell us a little about the geometry and fit? 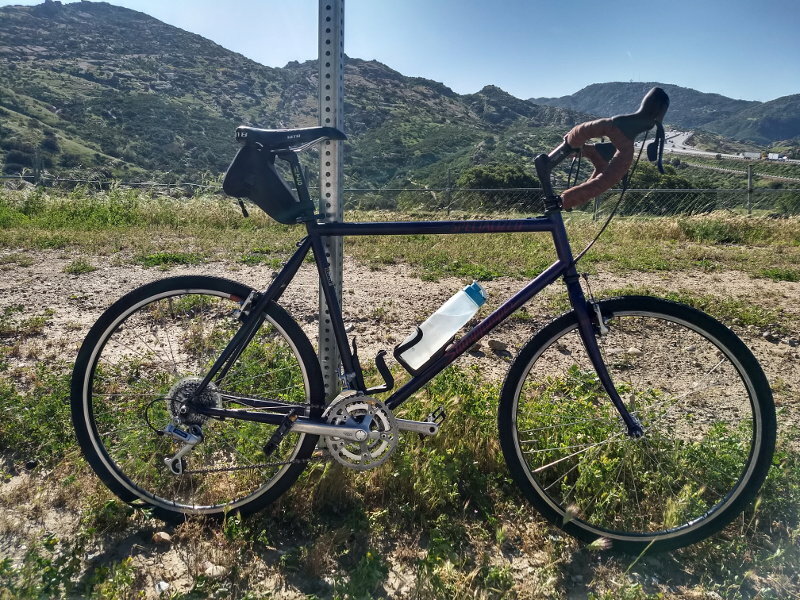 If a drop bar'd Klein Pinnacle is the poor man's Cunningham, then the Cannondale SM600 is a poor man's Klein. 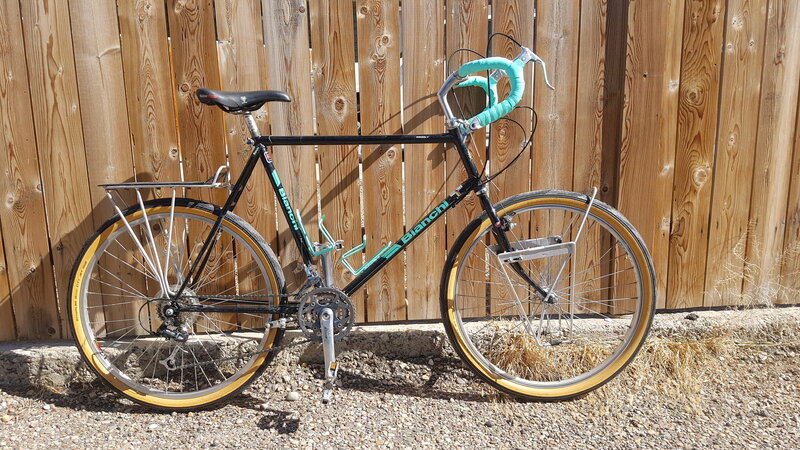 This one is from 1986, and wears all the original components, minus the bars (Nitto Randonneur), stem (Specialized, from an old Stumpjumper), Dia-Compe non-aero brake levers, Shimano barcons, and early '90s Specialized Cannibal tires. Bar and brake lever angle are optimized for riding in the drops, and the rando bars are a rideable placeholder until I can get my hands on a pair of true, flared dirt drops. The history (bike was once a part of the MOMBAT collection) and patina of the bike make me question the wisdom in further customization, but if the drop bar concept works for me in the long run it'd be really cool to strip the frame and reapply black decals to make it a more visually correct homage to a Cunningham. Dude... I was just daydreaming about how awesome it would be to do a drop-bar build on one of these. The universe delivers! Fantastic stuff! The day after I posted the bike I was able to take it onto the trail for the first time, and 10 miles of North Carolina singletrack helped lend some perspective. The ride was stiff and direct, but the steel fork certainly helped to take the edge off. No surprised there. 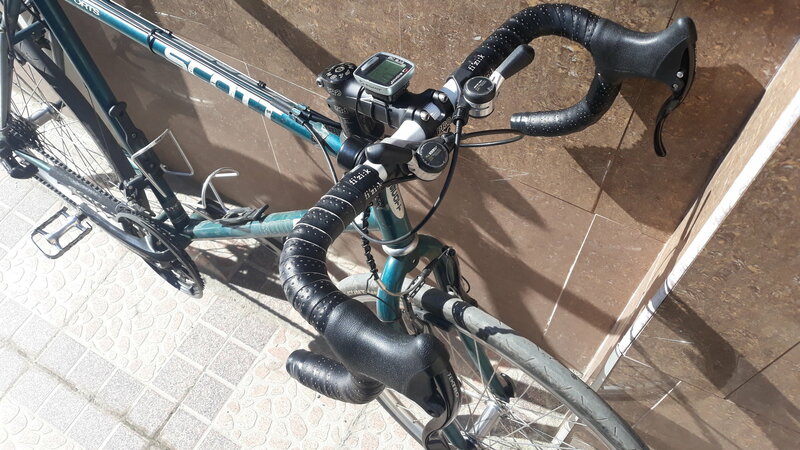 The brake levers played nice with the roller-cams, which provided decent modulation and stopping power despite the pads being original and rock hard. Moving from brakes to bar-ends was quick and easy due to the levers being positioned so deep in the drops. Shifting was easy; the reverse pull front derailleur took a moment to get used to but quickly became second nature to operate. 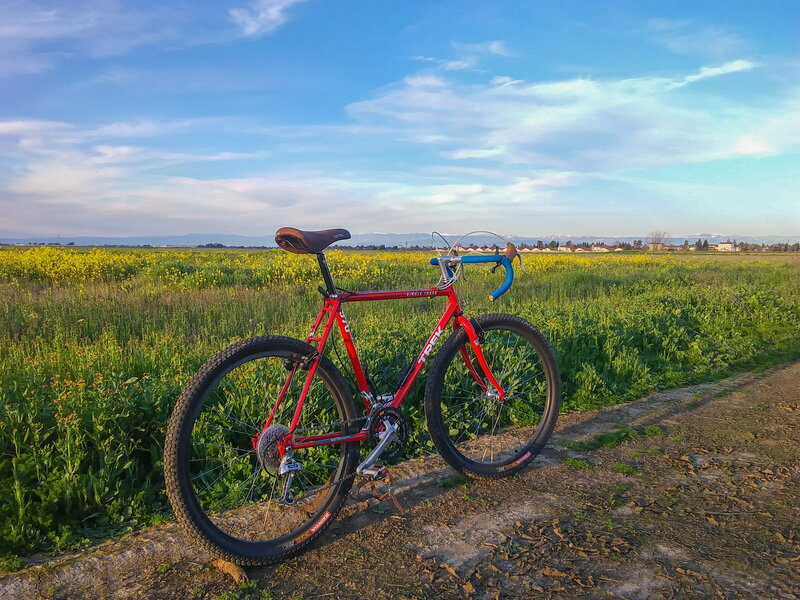 While they're older than I feel entirely comfortable riding, the Cannibal tires performed excellently. The overall fit of the bike felt good, but I'm built with a relatively short torso so the reach was just a bit on the long side. All in all, the bike performed as well or better than expected, and when dialed in will definitely find a spot in the regular rotation. A shallower drop or shorter stem is all that's needed to get the fit where it needs to be. I'm excited to make a few adjustments and hit the trails again. What size frame is that? 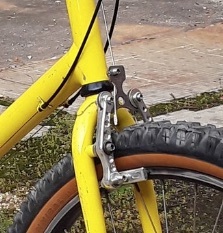 It looks to have a realy long head tube. Saddle nose to center of HB is 21.5". The headtube is indeed quite long, which is what prompted me to attempt a drop conversion. I don't know the actual HT measurement but when I get back to the shop next week I'll check it out and report back. All original Shimano Deore Dx except for the Suntour Command shifters. I finally finished my winter project. 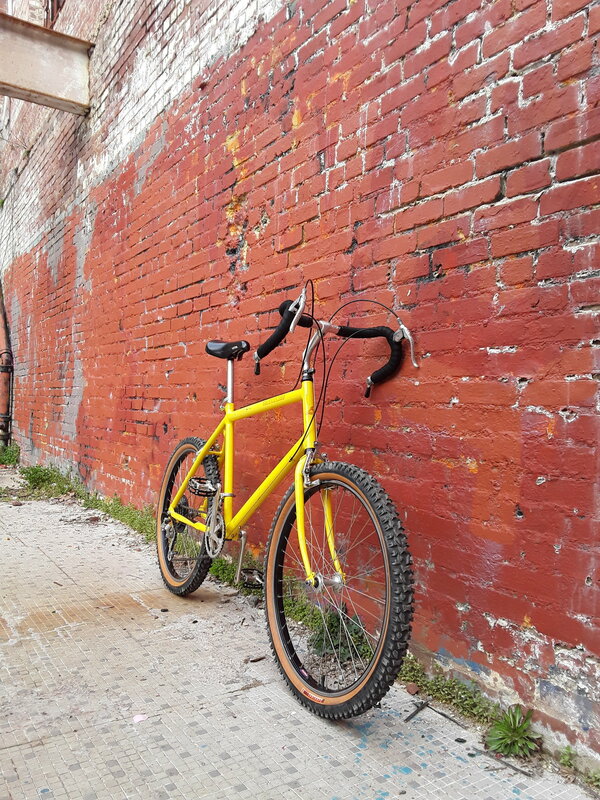 1987 Bianchi Grizzly drop bar conversion. 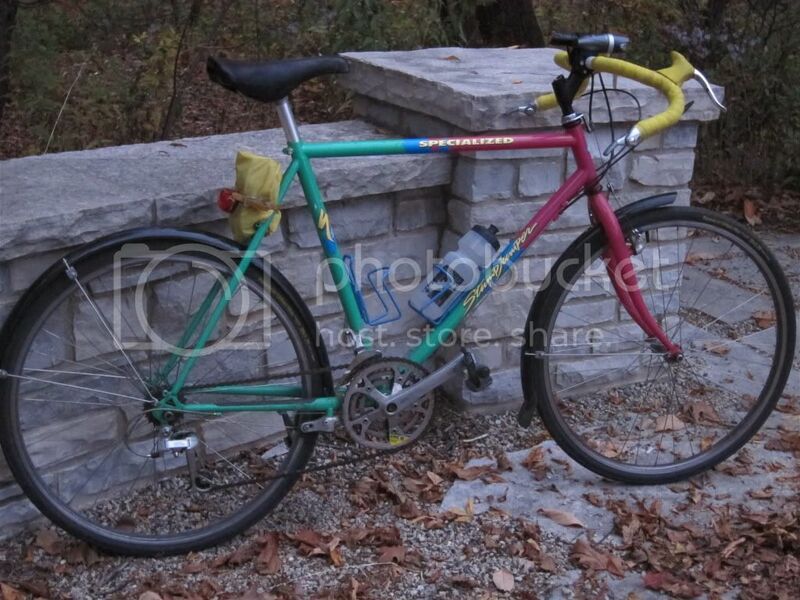 Will be using this for touring instead of my Miyata 1000. Hope you guys like it as much as I do! Put a lot of love into it. That looks great. Happy trails. For the rear wheel I would look for a used Rockhopper or something like that, swap the wheels, clean it up and resell. With a little luck it should be close to zero cost. I like the slack geometry and the teal highlights - looks like an all-day rider. What tires do you have on it? Schwalbe City Jet tires 26 x 1.90. Got them on sale for $12.99 ea at CRC. They feel cheapish, so I might upgrade soon. It's easy enough to swap in a quick release axle. Wheels Manufactoring has axles and cones that work for a lot of old hubs. Love that 970. 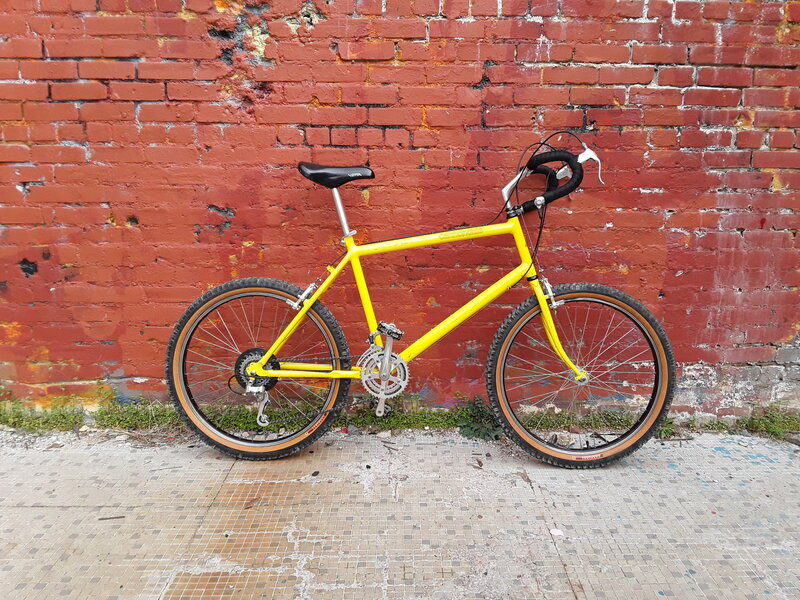 Those higher end Trek MTBs from that era are excellent. 950, 970 or even 990. I've had a few 950s, always have an eye out for 970 or higher just for the heck of it. 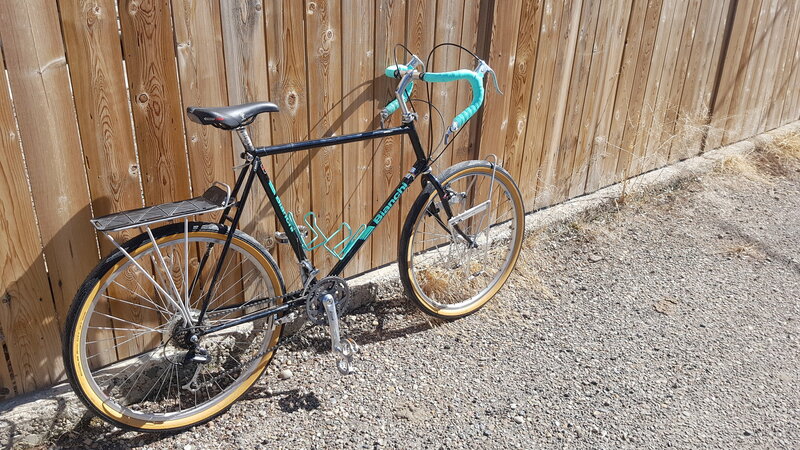 On the Bianchi, it was common for even the very top models, like a Stumpjumper, to have nutted axles front and rear. It was kind of a MTB thing. Some co-ops will have replacement wheels at a really low cost. I know the one I volunteer at sells wheels cheap! Last edited by wrk101; 03-27-19 at 07:14 AM. Here's my 92 Stumpjumper conversion. However, I'll plan on changing it back as I don't see myself taking it over my other drop bar bikes. The reach just isn't as comfortable. 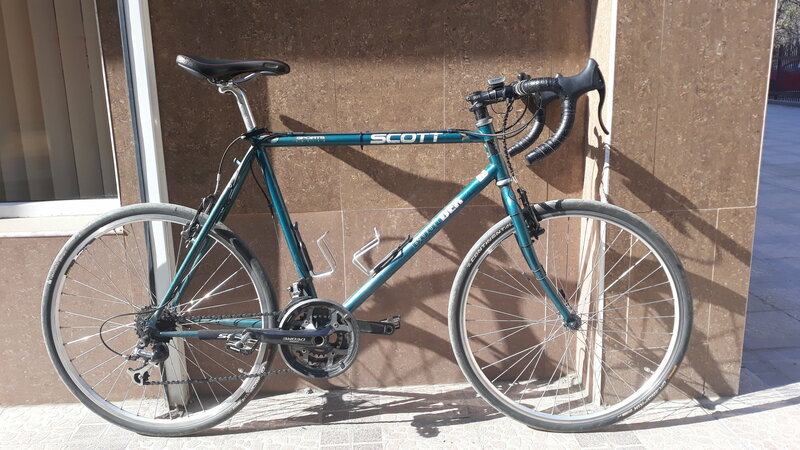 Using this Scott Boulder '94 frame with flat bars since 2012 finally converted it to a drop bar. I like it better now with deore xt 7sp thumb shifters on a pure fix 22.2 drop bar , tektro 540 brake levers and deore 48 36 26 triple to 12-28 back , deore hubs and mavic 317 rims. Last edited by av1; 04-01-19 at 01:47 AM. Another option is to go to a thrift store and buy an old 15mm wrench and cut the handle down so it'll fit in your saddle bag. Wheels with bolts seldom get stolen, I can't say the same for quick release wheels. There are many "standards" for axle threads so if you want to reuse the original cones be sure to bring the originals to make sure you get the appropriate axle thread. I like it! A very no-nonsense bike. Do you have any images of how the shifters are mounted? Last edited by av1; 04-08-19 at 05:33 AM. Thank you all for the inspiration! I just created an account because reading through the posts (all the way since 2012), has inspired me to show you my project. I've deeply enjoyed the pictures and stories you've posted. 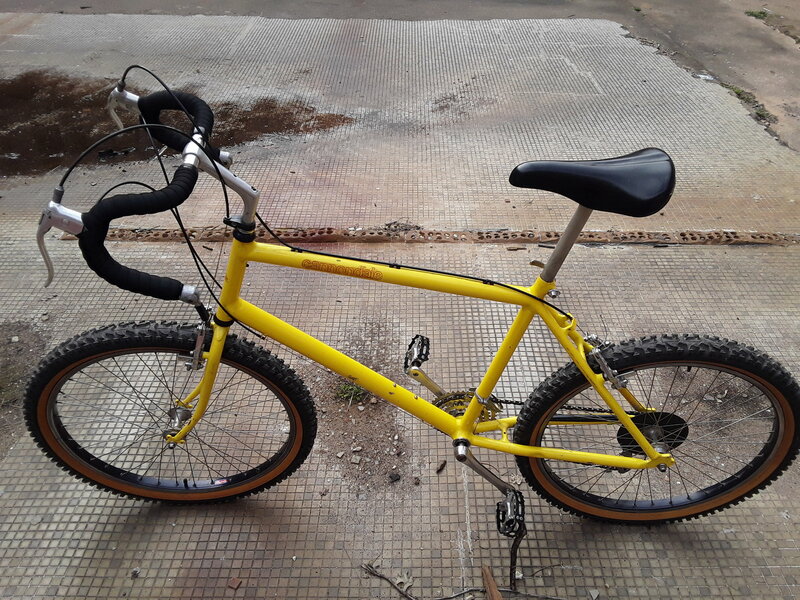 This used to be my dad's MTB bike. He loved it, but for many years, it has been neglected to the garage. While it was there, it was exposed to years to a leak that came from the pipes that drained the water from the terrace (apartment, not house), so it has built up a layer of calcite that ruined the paintjob. At the time of this post, it is being re-painted to stock conditions. Now, for the parts, most of it is just a mishmash of parts I had lying around. Given that I'm more of a track/road cyclist, most of the parts are from old road bikes I've had. 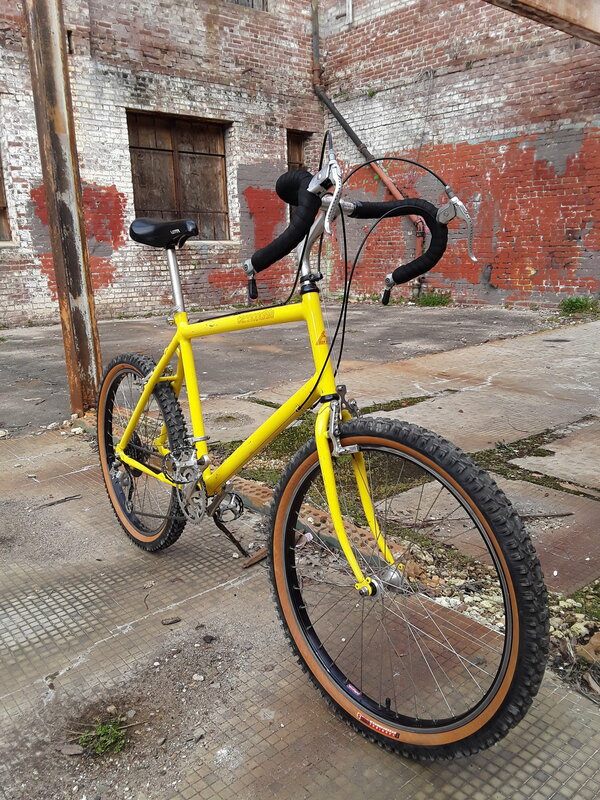 The idea is for this to have a more modern stance (I ride with really low bars (and no, my back is just fine)) but with the amazing geometry of this '90s Giant ATX 770. 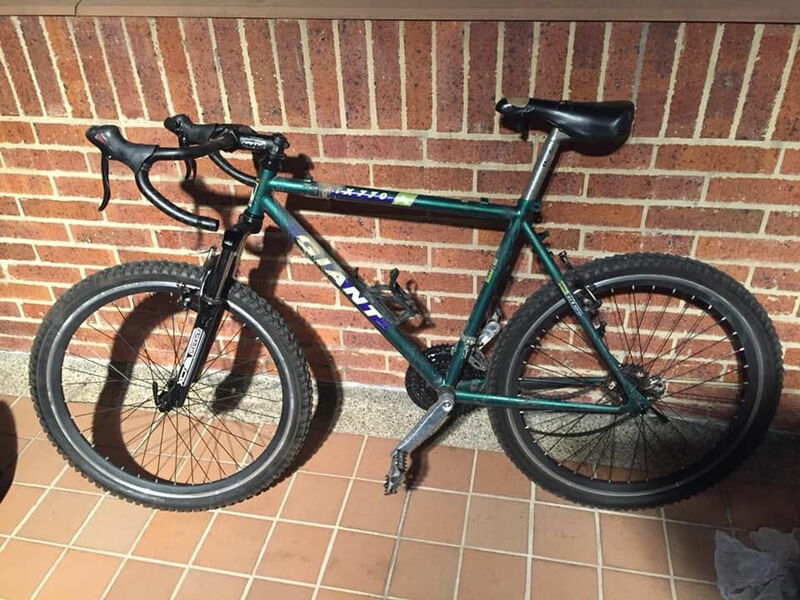 The seatpost was seized at the time this picture was taken. It has since been fixed (it only took months, tons of WD40, fire, a press, a soviet tank and black magic). It will be replaced by all-black hardware. 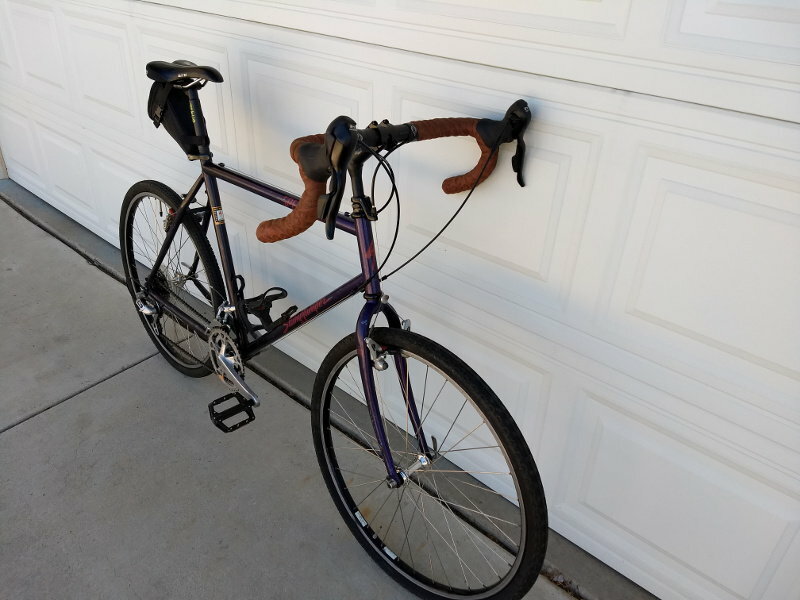 Handlebars, bar tape, seat post, saddle, cranks... all black, and coming from an old road bike. I might also source some canti brakes for good measure. Even though the V-brakes that it has are more efficient, I prefer the look of the cantis. I live in south america and good parts are difficult to get here, but if anyone has ideas or hacks for this project, send them my way. Thanks, and I hope you like it. I'll post pictures when it's finished (possibly in 3 or 4 days, when I pick it up from the paintshop). EDIT: This doesn't let me post the pic, so I'll add it later, when I meet the required post count. This is probably something I should do.